Employees who become increasingly cynical as they see colleagues sent away for development only to return and demonstrate little or no changes in behavior and speak a language that doesn’t mean anything to them. Leaders returning from training only to be blamed for not being able to affect changes upon their return; subsequently, they are removed, swapped out for other leaders, or moved to other teams. How do you develop your leaders? And is it working? For certain, while leaders aren’t fish, if they are treated like one the entire organization will begin to smell. Here’s what we mean. style, they pull a small net from their bag and scoop out a fish. They drop the fish into a small glass bowl. With care, they apply tiny brushes and scrub the fish. Then, seemingly proud of their work, they drop the fish back into the dirty tank. There’s no such word as “un-develop.” We use it here, however, to highlight a similar error and misbelief with which too many companies operate. The standard method for developing leaders today remains the Dirty Fish Tank Training Model: taking individuals from their environment, “cleaning them,” then re-submerging them back into the ecosystem of unchanged processes, structures and norms (the system). Whenever an organization attempts to develop the talent of a leader in a manner that is not congruent, or in harmony with, the system around that employee, they’re using the Dirty Fish Tank Training Model. Despite overwhelming evidence that the model is ineffective, many organizations still bring out their fish scoops and hope somehow isolating leaders will change the environment. There’s little mystery why little or no change occurs—and why companies, with the very best and strategic intentions, continue to suffer from inadequate talent development: As in any functioning, integrated system, to truly create sustainable changes in the thinking and actions of a person, the system around that person must be addressed and elevated as well. There is no doubt that the skill of the leader affects the performance of the team. We’re not suggesting that teams don’t gain some benefit from leaders being sent away for development. We’re saying that teams and the organization don’t benefit enough. It’s not even close. When we made the discovery we immediately wondered why we hadn’t seen it sooner. While supporting a multi-national client (we’ll call Company S), we used a common approach to categorize their efforts in learning and development by sorting their investments into three areas: leadership, culture, and talent. While Company S had invested hundreds of thousands of dollars in these three areas, they weren’t seeing an improvement. In fact, the data, including dismal business results, indicated they were losing ground. That’s when we saw it: Two gaps existed in their employee development. An assessment of the learning and development experiences employees of Company S were receiving showed that what they gained in a leadership training was not consistent or entirely aligned with what they or their peers were receiving in trainings focused on advancing the culture. Specifically, despite the high-quality, research-supported content leaders were gaining, it wasn’t connected to the world within which they operated. For example, the techniques being taught to hold people accountable were not consistent with Company S’s corporate values. Similar inconsistencies occurred when employees were sent to talent development courses; rarely was any connection made between the skills they were acquiring, the leadership methods being taught, or the real-life culture within which employees were expected to apply their new skills. Because of the disconnect between these elements, the employees were, in a sense, being treated like fish scooped from a tank (the system around them), cleaned, and then expected to affect change upon their return to the tank. Perhaps most importantly, with the macro view we had, we noticed a glaring omission: Where was the human element in all of it? 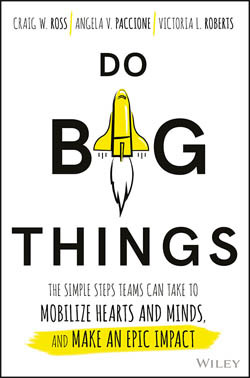 In other words, as Company S pushed employees through leadership, talent and culture programs, little regard was given to what the employee cared most about: Who they were as people, the lives they lead, including their families, their passions, and the relationships they have with those around them. Our 25 years of experience told us that without including the heart of the employee very little of what is taught in a classroom or online will be successfully integrated and sustained in the workplace. What we discovered that day: An organization’s success in effectively developing its leaders is correlated to the ability to effectively align and integrate four human components: Heart-inspired leadership, activated talent, one-team culture, and the whole person. We call this the System of Excellence. When these four elements are in concert with one another, we see ample evidence that the individual and the system evolve and co-exist together. Our experience shows that every element of the System of Excellence is vital in the design, delivery and sustainability efforts of any training. When this is the case, employees feel connected and inspired, their potential is activated, the teams within the culture function as one, and the employee’s whole life is elevated. Our breakthrough in the value we bring to our clients occurred when we broke from the age-old trend of removing leaders from their teams and insisted they learn with those whom they work with the most. We call this approach “Developing Leaders in the Context of Teams” (DLCT). It’s a practical approach that requires bringing the leader(s) together with those whom they must partner with to get a job done. Intact functional teams are common; however, we’ve replicated the DLCT success within cross-functional and project teams, as well as those teams newly formed through mergers and reorganizations. Employees take ownership of their development; because the heart of the employee has been incorporated into the process, participants feel connected and are both inspired and motivated to ensure successful outcomes are accomplished. An immediate performance impact; in large part because the leader and their team share a common language and are energized around a shared reality (all the fish contribute to evolving the environment). Sustained changes in leadership behaviors; cultural expectations and norms are elevated as a result of each person applying what they learned as they interact with teammates who learned the same things they did. This creates a virtuous cycle of reinforcing behaviors and feedback among team members. A new way of getting work done. Accelerated inclusion, alignment, and collaboration; because leaders are being developed with their team, traditional leadership hierarchies (and their subsequent, damaging “top-down” effect) are dissolved and replaced by relationships of trust. Due to the success of the DLCT approach, we also now work with teams of leaders from the same organization. In these cases, these leaders are seen as early adopters and change agents brought together as one larger team to activate the potential of the entire organization. What’s required: empowering the leaders to create a multiplier effect as they return to their teams and, by teaching what they have learned to others, leaders are able to activate expanded potential across the system. It becomes an efficient and cost-effective method for developing and engaging talent. There’s no doubt that enabling our clients to increase performance levels and deliver improved business results is gratifying. Perhaps, though, what’s been most exciting for us as we’ve supported our clients in using the System of Excellence approach as they develop their leaders, is this: There’s nothing like seeing employees become the heroes they can be. The System of Excellence isn’t about changing the inspired and effective leadership content or programs you already have; it’s about making sure what you are implementing has a chance to work within the system your leaders operate. Then, as your leadership programs deliver on their potential, the employees, especially those once thought incapable of changing their behaviors, transform and flourish. They get to show who they really are and what they are capable of doing. And, your business benefits.